Cameron Williamson raised a particularly interesting question in a piece he wrote in the Globe and Mail’s fashion and beauty section in March 2013 – They suit, they score: Are hockey players the next style icons? The article compared athletes from the four major sports, specifically, and how they dressed away from the game. Who were the trend setters? Who were the most recognized for their fashion sense? The conclusion was that up until recently, hockey players hadn’t really been the go-to fashion folk. At least that was until former NHLer, Sean Avery, interned at Vogue in 2008 and opened the doors for his colleagues to express themselves by what they wore. Avery pulled eyes away from other sports and forced them to look at the NHL as a fashion focal point. Now, hockey fashion is viewed and argued about among style aficionados all around the game – with every person having their own thoughts about who should be among the top dressed players. While Avery was certainly a well-dressed individual, he won’t crack this particular list thanks to his absence from the game. Others like former Bruins coach and voice of Hockey Night in Canada, Don Cherry, will also miss out on the list thanks to their eye-catching – yet unique – style. While it wasn’t easy, here’s a look at the seven most fashionable players in the NHL. Living it up in Canada’s capital city, it’s no wonder Erik Karlsson dresses in style. Soft-spoken and modest, his gear away from the game is anything but as he was named to Vanity Fair’s top 10 best-dressed NHL players in October 2013. Erik Karlsson defies the thuggish-defenseman cliché during his off hours in Ottawa with Euro-cut slim suits and button-downs that pop with colour. With his slick haircut and his well-crafted goatee, he’s taken all eyes off politics in Ottawa and demanded the attention of the Canadian capital fashionistas. First, in 2012, he became the youngest captain in NHL history at just 19 years and 286 days. Now, he’s arguably one of the best dressed players in the game. Whether it’s the spiked hair, the skinny ties, or the European slim suit, Gabriel Landeskog has drawn the attention of fashion fans. 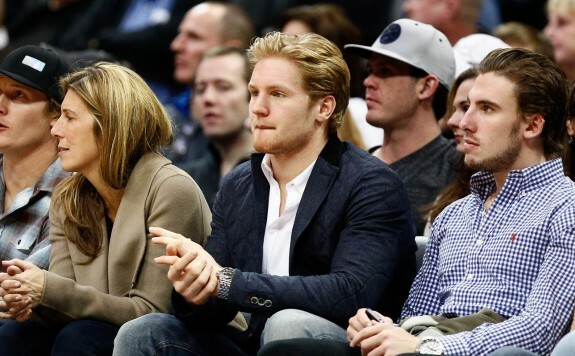 Named to Vanity Fair’s best dressed players, Landeskog makes sure he’s at the top of his game even when he’s sitting court side at basketball games. Patrick Sharp proves that it’s not just fancy suits and styled hair that can catch the eye of the camera. While he can still sport the slim suits, as he did at the opening of the Ermenegildo Zegna store on Michigan Avenue, the Blackhawks’ forward doesn’t mind dressing down – in style. Sharp was also listed on Chicago Magazine’s 50 Most Beautiful Chicagoans in March 2011 and joined teammate Patrick Kane in owning the cover of Michigan Avenue’s November 2013 edition. While he might not be the top scorer in Chicago, there’s no argument that he is certainly the number one Blackhawk fashion-wise. While Leafs’ forward Joffrey Lupul might be remembered most – fashion-wise – for his lack there of in ESPN’s body issue, he’s no stranger to dressing it up every once and a while as well. Not only was Lupul profiled on MTV’s Play With AJ as a fashion icon among NHL players, but he also teamed up with Gotstyle for a game day series that saw him wear 40 different looks on 40 different game days giving fans a chance to vote for their favourite suits. And hey, if you want to hear some of Lupul’s tips for looking good, he even shared his top five fashion tips in Elle Canada. Leading a dual life, Lightning forward Steven Stamkos is not only one of the most lethal scorers in the NHL, but he’s also among the top dressed players in the game. For Stamkos, it isn’t just about dressing well, it’s about knowing what he’s wearing. While he’s been left off of hockey’s best-dressed lists – until now – for the Lightning captain, it’s all about the smaller fashionable assets. In fact, Stamkos endorsed the high-end Tissot watch brand – even scoring his own limited edition line of watches. While they won’t have him turning heads as the most fashionable player, Stamkos has also landed endorsement deals with Nike and Bauer during his career as well. And just for good measure, Stamkos was caught sporting some Louis Vuitton shoes at the Canadian launch of his Tissot watch line in 2011. He is arguably the most charismatic player in Montreal right now, and with his new eight-year deal will likely remain that way for a long time. But charisma and captaincy discussion aside, P.K. 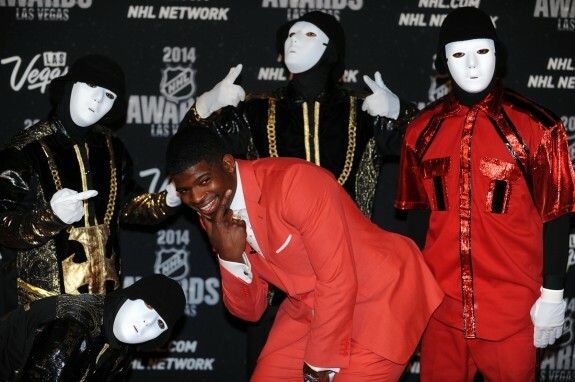 Subban is one of the NHL’s most fashionable and best-dressed players. Seriously, PK Subban has blown Lundqvist off the throne and right out of the palace in terms of NHL fashion sense. Not even close. Some have debated where he sits on the NHL’s best-dressed list, while others have argued that his style is over the top or questionable. But there’s no denying that when it counts the 25-year old can put on a fashion show of his own. In fact, discussed in Dolce Vita magazine in 2012, it’s his interest in different styles and colours that set him apart. Sartorialto is the Montreal-based tailor that custom makes most of Subban’s suits – a company he credits with helping him elevate his fashion game. It’s not just fancy suits and fedora’s for the Canadiens’ defenceman though. He’s been known to sport anything from t-shirts to sweaters, or v-necks with baseball hats. Anyway he dresses, he takes pleasure in looking his best and keeping the eyes on him wherever he goes. The undisputed number one when it comes to best-dressed in the NHL, Henrik Lundqvist plays in the perfect city to accentuate his taste for fashion. Named to Vanity Fair’s list as well, Lundqvist has always found a way of staying ahead of fashion trends. But Lundqvist isn’t just focused on what he wears. In fact, the Rangers’ goaltender has attended charity events, store openings, and fashion weeks around the world. He attended an event at New York’s famous store Barney’s for UNICEF in 2013. He also made an appearance at the 2010 Victoria’s Secret fashion show. Most recently, he partnered up with clothing line Bread & Boxers – a line that is about simplicity as Lundqvist explains in his Forbes Magazine interview. Like Subban, Lundqvist acknowledges that fashion is an interesting field to flirt with. But it’s something that just comes naturally to Lundqvist, according to his interview with Mr. Porter. It’s an area that emphasizes individuality. Regardless of how his team dresses though, it’s Lundqvist that definitely leads the way in New York and in the NHL fashion-wise. He’s an ambassador for the game’s evolving relation to fashion and that will likely be passed on to the newer generation of players – a move would likely impress all of the players on THW’s best-dressed list. For more, follow Andrew on Twitter @AndrewGForbes or his Tape2Tape column @Tape2TapeTHW.